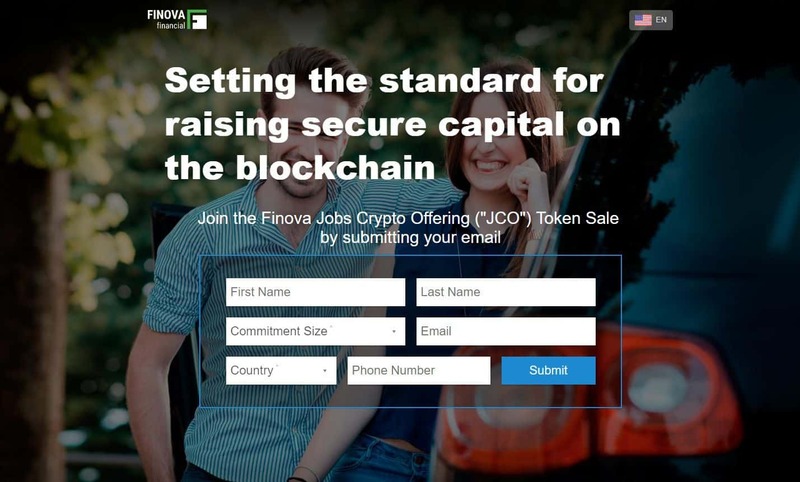 Finova Financial, a digital financial services provider transforming the future of global banking, announced today the creation of a fundraising process known as a JOBS Crypto Offering (JCO) which, when completed, will give investors the opportunity to invest in equity ownership of previously privately-held companies using cryptocurrency. The JCO is a hybrid of initial coin offering investments (ICOs), which allow companies to raise capital more readily through cryptocurrency investments and an initial public offering of stock. In a JCO, “tokens” representing ownership of shares of capital stock would be tracked on a distributed ledger or blockchain (Tokens) and would be sold pursuant to a registration statement filed under the Securities Act or a transaction which is exempt from registration under the Securities Act pursuant to Rule 251 under the Securities Act (i.e. Regulation A+). The JCO is the brainchild of serial fintech entrepreneur, Gregory Keough, who is the current CEO of Finova Financial and former CEO of Mobile Financial Services, a MasterCard and Telefonica Joint Venture for mobile financial services globally. “We think the JCO has the potential to have a massive impact on the way startups raise funds, while creating some much-needed regulatory clarity in the crypto-investing space,” said Sheel Mohnot, Partner, 500 Startups. Passed in 2012, the Jumpstart Our Business Startups Act (JOBS Act) was designed to help small businesses raise capital by easing certain securities regulations, expanding options for entrepreneurs to seek out everyday investors to raise capital and grow their companies via online crowdfunding platforms. The JOBS Act was also known as the Crowdfund Act because under Title III it created a way for businesses to use crowdfunding to raise capital by issuing securities – which had never been done before. Along with the crowdfunding aspects of the JOBS Act, the act also changed a number of laws and regulations to make it easier for companies to raise capital privately and go public. Working to transform the future of banking on a global scale, National Financial Holdings, Inc. (known as “Finova”) develops fair and affordable digital financial technologies to create a more inclusive financial system and provide a path to financial health for the two billion people outside of the traditional financial system. Founded in 2015 by a team of financial services, technology, and payment experts, Finova is backed by leading Silicon Valley venture capital firms and Wall Street private equity investors.